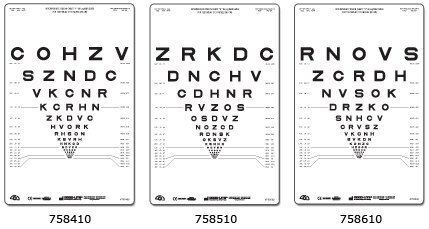 Sloan Letters charts calibrated to test visual acuity at an intermediate distance of 66 cm (26 in.). 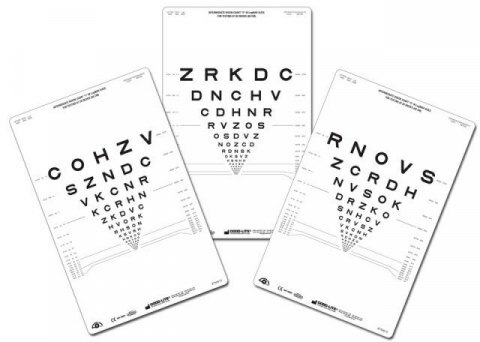 These adult standardized charts are available in 3 different scrambled versions for repetitive testing situations. Sloan Letter optotypes with proportionally spaced lines; line sizes range from 20/400 to 20/10 (6/120 to 6/3) equivalent. Notations for Letter Size, Decimal, and logMAR are also on the chart. This chart can either be wall mounted or used in an ESV1200, ESV1500, or a Model A+ illuminated cabinet. Chart size is 9" x 14" (22.9 cm x 35.6 cm). 66 cm, 26 in., testing distance. Cena dotyczy jednej tablicy .